1. Attention is better put on what God says rather than an individual's story. 2. These extricated experiences are not IT. They are part of it, or a tracing of some of it, but they are not IT. Even if every thread were described, we wouldn't have the truth. The truth is God leads us, and we can only guess how after the fact. 3. My story could be misleading. We all stumble alike, and still good things happen. I was born into a Jewish family that was not spiritual or religious. My dear parents rather considered God as something people pretended to believe in, but no one really did. I did not buy into this, but I did not relate to God either. I had no thoughts about God. There is one thing I can look back on in my young childhood that might have been a sign of something to come. It's a stretch to say so, but this is my story, so I can say so. There was a large poster rolled up in a closet in our attic that I spent time unrolling and looking at. The poster was a picture of the face of a beautiful baby. The sky above the baby was dark blue and there was a star radiating there. It was a picture of Baby Jesus. I didn't know that then. My mother kept this picture because it looked like my brother Bennie when he was a baby! Now we skip about fifty years, although there are also other possibilities and twists and turns that could be included, and are not. Quite by chance, I saw part of JESUS CHRIST SUPERSTAR on my daughter's TV. Then another time, again by chance, I caught another part of it, and I fell in love with it. My daughter recorded it for me. From then on, that was what I did just about every evening, watch JESUS CHRIST SUPERSTAR. I watched it 125+ times. It was not simply a movie to me. God or Christ had enchanted it, or me, and I was there in the movie right with it. It played in my heart. All of the stories of Christ's divinity I had learned in public school never made a dent in me. Quite the opposite. But in JESUS CHRIST SUPERSTAR, his humanness drew me, and it was his humanness that awakened me to his divinity. He could get annoyed with his friends. He could be impatient. His friends let him down; why couldn't they even stay awake with him? And he wasn't keen on being crucified. He was real, spoke wisdom, and was innocent. It was through his humanness that I came to love him with all my heart. Then JESUS CHRIST SUPERSTAR turned into a regular movie again, and the spell was over, as all spells are. The same scenario was played with GODSPELL, appearing on my daughter's TV; she recorded it for me, and I watched it fascinated for 35+ times. The second time I saw it, in the scene where Jesus removes the make-up from the faces of his friends and says good-bye to them, I heard myself blurt out: "I will never leave you again." Now I am coming closer to how Heaven Letters™ came about. A friend of mine gave me a framed picture of Jesus. 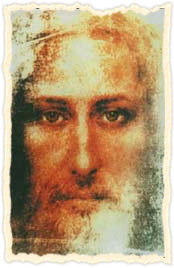 It was the picture of Christ manifested by Sai Baba from a photograph of the Shroud of Turin. I kept that golden picture of him on my coffee table. When I was alone, I would sit by myself and really look into his eyes. His picture would melt me every time, and I would find myself crying. His compassion came forth from his eyes into my heart, and I would cry. One time, no different from any other time, I was by myself, looking into his eyes, and suddenly Christ came out of the picture into the room and appeared before me. And then, before my eyes, his distinct image became golden light, all aura, and the light swirled before me and filled me. And then he spoke to me. He said, "Gloria, I have been seeking you for a long time." I said out loud: "YOU'VE been seeking ME?" He said, "Yes, I have been seeking you for a long time." And he went back into the picture. Then I had a clear insight. I think the insight was given to me, and it wasn't really mine. It was that the seeker and the sought are the same. The seeker and the sought are the same. At the moment, I understood that fully. It had not been said in words, but I understood that that was what I was supposed to know. That was the meaning of what Christ had said to me. I cried and laughed, and I thought that from then on, whenever I would look at that picture, Christ would appear to me again in gold light, but it never happened again. I believe he introduced me to God and handed me over to Him. And I write down God's words, which, of course, He wants shared with all who can receive them.